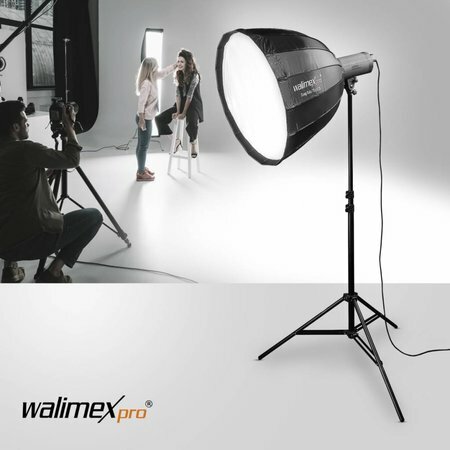 The Deep Rota softbox from the walimex pro Studio Line is a professional light control to give portraits that something special and particular light tone. Parabolisch ontwerp, bijna rond, diameter 120 cm. The Deep Rota softbox from the walimex pro Studio Line is a professional light control to give portraits that something special and particular light tone. The 16-edged and hence almost round Deep Rota Softbox creates wonderful catch-lights in the eyes of the model and has – thanks to a construction that is deeper than normal beauty dishes or flat softboxes – a special light effect. The flash reaches the model in a more targeted and focussed manner, creating more depth and a more interesting image effect while obtaining softer and more even illumination. 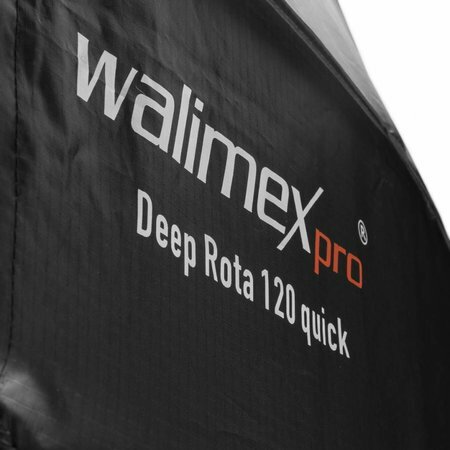 No more fumbling around with rods and individual parts: The new Quick Assemble “QA” softboxes in the walimex pro Studio Line are – as their name suggests – fast and easy to assemble and, of course, can be just as quickly taken down and tidied away when you’ve finished. 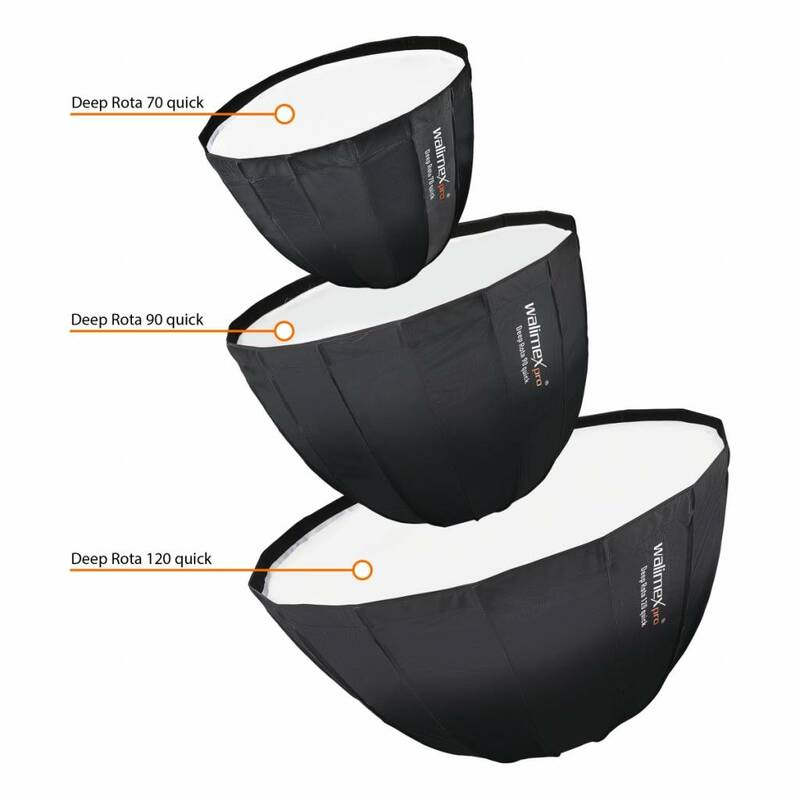 So, it’s the ideal solution not just for photographers who need to make room quickly after the shoot; it’s also suited to photographers who want to use the Deep Rota softbox for outdoor portrait shoots. 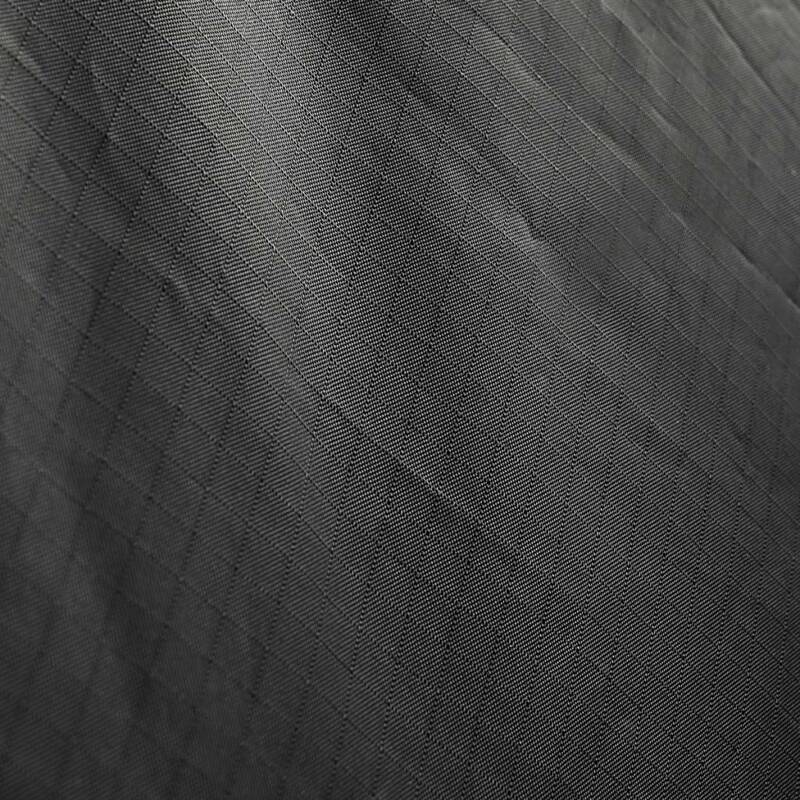 When folded up and placed in a large carry bag, the complete Deep Rota softbox – incl. 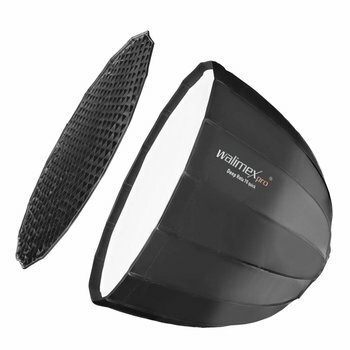 softbox adapter (which can be obtained separately for all flash systems), the inner and outer diffuser and the honeycomb or grid – is so compact that it can be used for any set-up and is always at hand. To assemble, simply place the folded softbox with the speed ring / softbox adapter faced down on the ground and the Deep Rota softbox pops open like an umbrella until the mount clicks audibly into place in the umbrella rod. 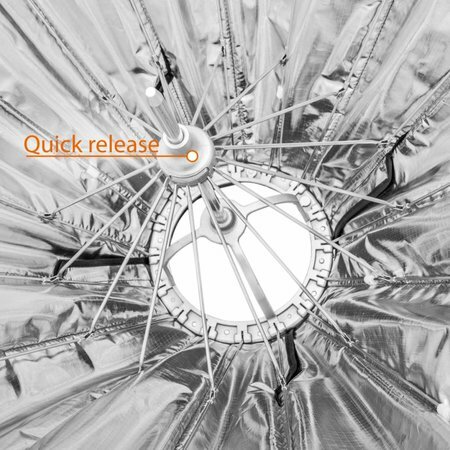 Turn the mounted softbox around so that the speed ring is at the top, and fix the covering to the four lengthways placed hooks and loop fasteners – this will ensure everything is pulled tightly and no unwanted flashlight will escape sideways. The Quick Assemble system deserves its name and saves all photographers time – whether beginners, amateurs or professionals. 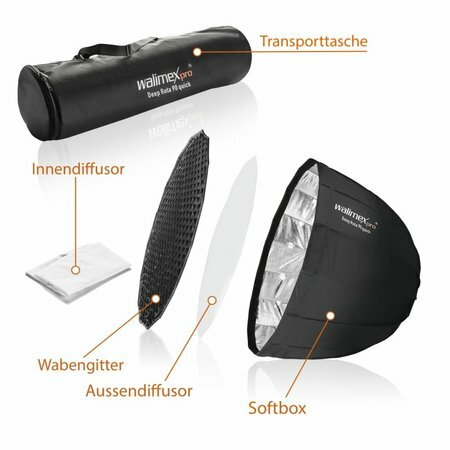 To connect your Deep Rota softbox to your flash system or flash heads, it has a walimex pro softbox adapter which is included in your set. 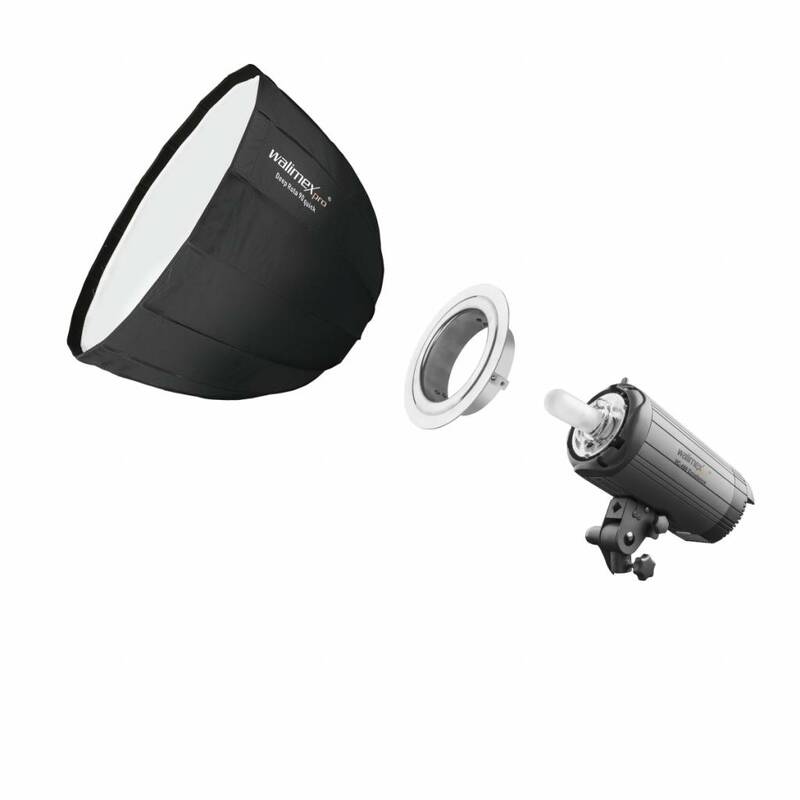 The softbox adapter is then simply placed into the speed ring (quick-release bayonet) and fixed in place with four screws – the Deep Rota softbox is then ready for use with your flash head. For transportation with the carry bag with straps included in the delivery, the softbox adapter can then, of course, remain mounted. Another feature: The type of softbox and the dimensions are printed on the various softbox bags – so the tedious search for the right softbox on the “boom of the light control” is finally a thing of the past, and you have the right light control to hand. The softbox comes as standard with three accessories so you can use the Deep Rota softbox for all desired light settings and are free to model the image however you want: Grid or honeycomb, inner diffuser and outer diffuser. The inner diffuser is simply connected to the middle of the softbox with the sewn-on hook and loop fasteners provided for this. The outer diffuser is secured with broad hook and loop strips on the upper end of the softbox. Above that, there is still enough space to secure the grid or honeycomb, too. It can be done quickly and leaves the photographer more freedom and occasions to experiment with different inserts and attachments. With the new easy and fast-to-mount Quick Assemble softbox system from the walimex pro Studio Line and the cleverly designed versatile light controls, you’ll be perfectly equipped for all shoots and can turn all your photo ideas into reality. Be creative – we’ll provide the right equipment.